Calendar: «International Day of Charity». «The things of the spirit» illustrated quotation. Charity, free quote pictures for Facebook, Twitter, LinkedIn, Reddit, Pinterest and other social networks. We must always remember that it is the things of the spirit that in the end prevail. That caring counts. That where there is no vision, people perish. That hope and faith count, and that without charity there can be nothing good. That by daring to live dangerously, we are learning to live generously. 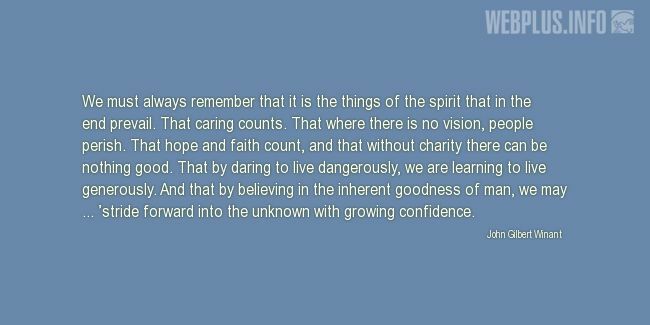 And that by believing in the inherent goodness of man, we may ... ’stride forward into the unknown with growing confidence.